NOT SURE WHAT TO GET? NO SWEAT! – Do you know when your loved one last upgraded? Or whether they’d prefer black frake or abalone shell? If not, no worries. That’s what gift cards are for. As magical as it can be to give or receive the perfectly, almost psychically selected gift, it’s always better to ask a question than make a mistake. 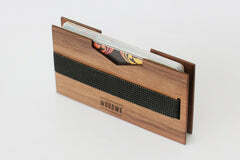 SHOW YOUR LOVE WITH CHOICES – A WoodWe accessory should be a unique expression of self, and when you give your loved one a WoodWe gift card, you show them how much you respect their intangible, sometimes unpredictable individuality. 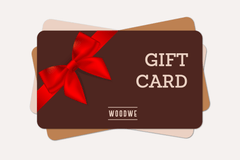 GLOBAL CURRENCIES AVAILABLE – WoodWe gift cards are available in €30, €50, €75, and €100 increments. Not sure how much a euro is worth? You and your loved one deserve to know exactly what you’re getting, so we offer conversion to seven currencies from around the world. DIGITAL DELIVERY – Your gift card will arrive via email and can be printed out for inclusion in a greeting card, or sent along to its final recipient digitally. Perfect for long-distance gifting without unnecessary shipping steps! NO ADDITIONAL FEES – Really. What you pay is exactly what your loved one gets to redeem toward their WoodWe order. Nothing gets siphoned off in processing!